I've been railing on the White House to pass a job stimulus if they want to protect the Democrats' advantage in Congress. 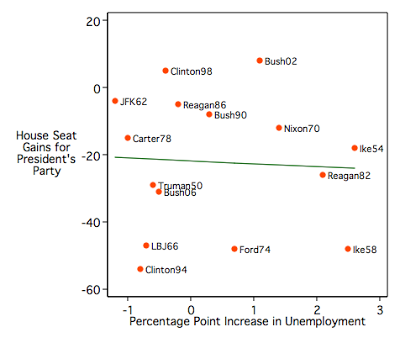 But this great work form Enik Rising suggests that employment means bubkes for midterm elections. Bubkes! Here's his evidence. 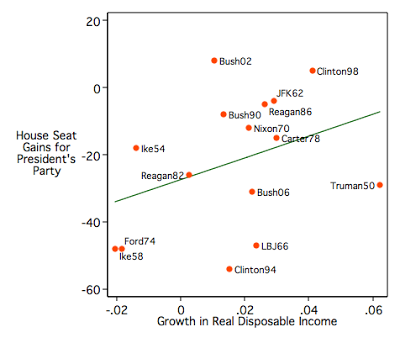 And Seth Masket goes the extra step to compare House gains to rising disposable income, and finds a statistically significant correlation. At least two things are clear from these graphs. One, presidents lose House seats in midterm elections as a general rule. Two, 2010's job picture has little historical precedent since only the 1982 midterms come close to 9 percent joblessness. 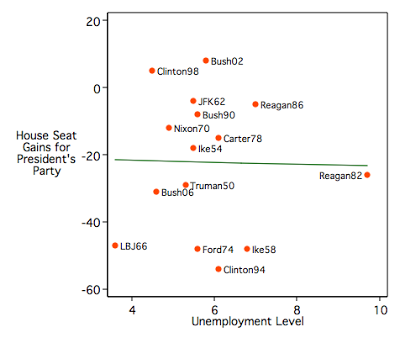 In that midterm, Reagan lost 27 Republican seats in the House. Even Masket concludes that "a ten-point increase in the president's Labor Day Gallup approval rating can save the president's party 16 seats in the House." That's a lot! The 2010 picture still seems pretty clear to me. To avoid significant partisan churn in 2010, the Democrats need Obama to be popular. To be popular, Obama needs to save more jobs. To save more jobs, the White House needs to get creative.